About three years ago, I wrote some posts about dances for four. With the earlier ones, I speculated that they were more enjoyable than the danses à deux because they were less technically demanding. This very obviously applied to the minuets ‘à quatre’ of which five survive in notation. Le Menuet à Quatre. Anonymous, 1706. I discussed Mr Holt’s Minuet & Jigg back in 2015, so this time round I will look just at the four French choreographies. Unlike the English dance, the French ones are all simply minuets using the pas de menuet pretty well throughout. Before I analyse each of them in more detail, here are some facts and figures for comparison. The anonymous Menuet à Quatre appears in Feuillet’s Vme Recueil de danses de bal pour l’année 1707 published in 1706. It is the last of the three dances in that collection, the other two being danses à deux. The source of the music has not been identified, although it does appear in a set of ‘Suites de danses … qui se joüent ordinairement à tous les bals chez le Roy’ dated to the first decade of the 18th century. 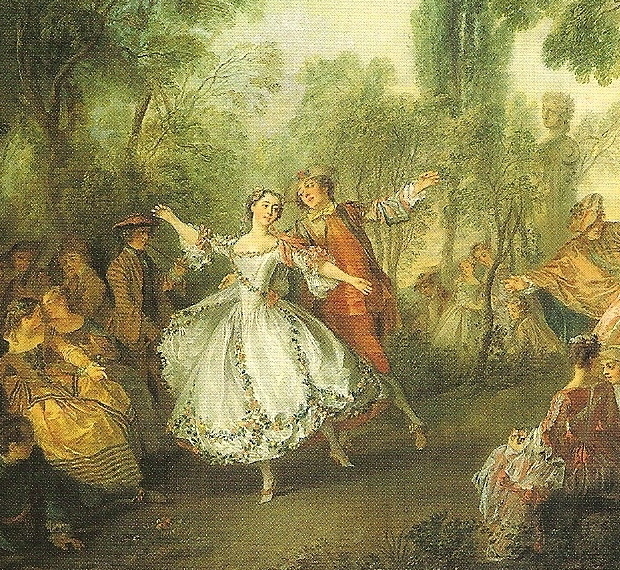 In his Avertissement for the collection, Feuillet says that the minuet is ‘si en vogue qu’il ne se fait aucune assemblée où il ne soit dansé’, adding that he has ‘pris le 1er air qui m’a tombé sous la main car tous les menuets y sont également bons’. The choreography has the musical structure AABBAAB (A=B=4) and is short, with only 28 bars in 6/4. Pecour’s Menuet à Quatre appears in the Nouveau recüeil de dance de bal et celle de ballet published by Gaudrau around 1713. This collection brings together 9 ballroom dances and 30 theatre choreographies, with the Menuet à Quatre as the last but one of the ballroom dances. The musical source has not been identified. The choreography has the musical structure ABACABACA (A=B=C=8) giving a rondeau form and 36 bars in 6/4 (the music is written in 3). Again, this dance is short. In his Preface to the collection, Gaudrau tells us that Pecour’s choreography was danced at the last ball at Marly (Louis XIV’s country retreat, where the King could relax away from the rigorous etiquette of Versailles). Dezais includes La Carignan, Menuet à Quatre in his Premier livre de contredances published in 1725. Little or no research has been done on this collection (which does not feature either in the Little & March 1992 catalogue La Danse Noble or Lancelot’s La Belle Dance of 1996) so I cannot tell whether there is a concordance for the music. This choreography uses a musical structure 3 x AABB (A=B=4). At 48 bars of 6/4 music it is a little longer than its predecessors. The Minuet aquatre figuret by Pecour is recorded in the manuscript compiled by the dancing master Felix Kinski in Oporto in 1751. It appears among other French ballroom choreographies, presumably brought together (and taught) by Kinski. This minuet for four is very different from the others. The choreography’s music, for which no source has been identified, has the structure 7 x AABB + AA (A=8 B=16) with 120 bars in 6/4 (the music is written in 3). The dance has a ‘Change’ and ‘Figure’ structure very much like a cotillon. As I mentioned in posts back in 2014, the form of the cotillon goes back at least as far as 1705 and Feuillet’s ballroom dance for four entitled Le Cotillon. Such dances seem to have been popular around 1715-1725, so perhaps Pecour’s choreography belongs to that period. What do these facts and figures tell us? The evidence confirms a couple of things. One is that menuets à quatre were danced at French royal balls and were popular lower down the social scale. Another is that, like the menuet à deux, they could be danced to any minuet music (though, perhaps, the A, B and, sometimes, C strains needed to be the right length). I will address other questions in later posts, for example how the menuets à quatre relate to the menuet à deux as recorded by Pierre Rameau in his 1725 treatise Le Maître a danser and how they relate to each other. Anonymous. Le Menuet à Quatre (Paris, 1706), First plate. This entry was posted in Ballroom Dancing, Dance Treatises & Notations, The Minuet, Uncategorized and tagged Felix Kinski, Guillaume-Louis Pecour, Jacques Dezais, Michel Gaudrau, Raoul Auger Feuillet on April 2, 2018 by moiragoff. Guillaume-Louis Pecour’s ballroom duet L’Allemande was first published in notation in Paris in 1702. It had originally been performed by Claude Ballon and Marie-Thérèse Subligny in the ballet Fragments de Mr de Lully that same year. Its ensuing popularity was such that it was published again by Pierre Rameau in his revised version of Beauchamps-Feuillet notation within his Abbrégé de la nouvelle méthode in 1725, alongside other much-loved ballroom duets. L’Allemande was also included in the second and third editions of Rameau’s treatise, published around 1728 and 1732. 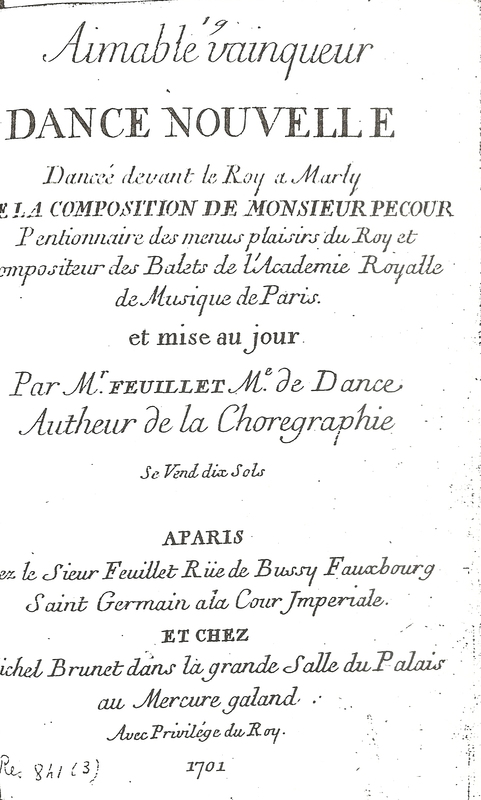 Magny included the dance in his Principes de choregraphie, published in Paris in 1765. This marked its last appearance in notation, for which Magny had given the dance a different tune. In her catalogue of surviving French dance notations, La Belle Dance, Francine Lancelot notes several manuscript versions of the duet some of which vary from the original. With such a popular choreography, it is perhaps surprising that no dance with the title L’Allemande was (apparently) advertised by London’s theatres until 2 January 1735, when Mlle Chateauneuf gave it as a solo at the Little Theatre in the Haymarket. When she returned to London for the 1739-1740 season, this time appearing at Drury Lane, she reprised her solo L’Allemande. The following season, again at Drury Lane, she was advertised with the dancer Muilment in a duet entitled L’Allemande. The dance was obviously very popular, for it was given in the entr’actes more than 20 times between 30 September 1740 and 5 May 1741. There is no evidence to tell us what sort of dance either the solo or the duet L’Allemande were, but could the latter have been Pecour’s famous choreography of nearly 40 years earlier? Both Mlle Chateauneuf and Muilment had been described as ‘lately arriv’d from Paris’ on their first appearances at Drury Lane, on 13 September 1739 and 18 November 1736 respectively, so they are likely to have encountered the dance there. If it wasn’t Pecour’s L’Allemande, then the duet given in London must surely have included what became known as the ‘allemande’ hold, in which the two dancers interlace arms behind their backs for some sequences of steps. This was a particular feature of Pecour’s choeography, depicted in the 1702 notation because of its novelty. When the allemande re-emerged in the 1760s, as a contredanse (a type of cotillon) and then a duet, this arm-hold was still much used. There seems to be no particular reason for the billing of an allemande in London’s theatres during the 1730s and 1740s. The dance was, presumably, part of Mlle Chateauneuf’s repertoire and became popular with audiences when she introduced it to London. There were a number of other allemande dances on the London stage around the same period, some of which may have been trying to capitalise on Mlle Chateauneuf’s success. Two were given at benefit performances for the dancers concerned: La Pantomime de Suisse et D’Alemande performed by the ‘French Boy and Girl’ at Covent Garden on 13 May 1740; and a ‘Comic Dance call’d L’Allemande’ given by Picq and Sga Campioni at the same theatre on 18 April 1745. There was a ‘New Dance call’d Les Allemands Joyeux’ given by Lalauze and Mlle Auguste at Covent Garden a handful of times during the 1741-1742 season, which sounds like dancing Germans rather than a purportedly German dance. And what was the ‘New Grand Ballet called Les Allemandes’ performed by Cooke and Sga Campioni with supporting dancers at Covent Garden several times during the 1745-46 season? Following this ‘Grand Ballet’, the allemande was not to return to the London stage until the 1767-1768 season, when the entirely new dances entitled ‘allemande’ had become the rage. This entry was posted in Ballroom Dancing, Stage Dancing and tagged Allemande (Dance), Baroque Dance, Guillaume-Louis Pecour, Marie Chateauneuf on November 7, 2017 by moiragoff. As every musician knows (but not necessarily every dancer), the passacaille is a set of variations over a repeated 4-bar bass line. It shares this musical form with the chaconne, although the notated dances surviving from the 18th century reveal several differences between them. In her recent book Dance and Drama in French Baroque Opera, Rebecca Harris-Warrick looks at passacailles and chaconnes from various perspectives. Her observations are of interest in relation to the appearance of these dances on the London stage. Harris-Warrick points out that passacailles have a slower tempo than chaconnes and that they are often found in association with women ‘not infrequently when seduction is involved’ (p. 60). She also explains that they are the longest of the dances performed on stage and usually feature soloists and groups of dancers in their choreography (although this is not the case with the notated dances). Passacailles are indeed the longest of the surviving recorded choreographies, in particular two solos created for female professional dancers: Anthony L’Abbé’s ‘Passagalia of Venüs & Adonis’ for Hester Santlow to music from Desmaret’s 1697 opera Vénus et Adonis, 209 bars; Guillaume-Louis Pecour’s ‘Passacaille pour une femme’ for Marie-Thérèse Subligny to music from Gatti’s 1701 opera Scylla, 219 bars. In all six passacailles survive in notation, published between 1704 and the mid-1720s. All are to music from French operas, four are female solos, one is a female duet and one is a duet for a man and a woman. Advertisements indicate that the passacaille was performed in the entr’actes at London’s theatres quite regularly between the 1705-1706 and 1735-1736 seasons. It was given either as a solo or a duet but not, apparently, as a group dance. The solos are exclusively performed by women, from Mrs Elford at the Queen’s Theatre on 13 June 1706 (when she danced a ‘Chacoon and Passacail’) to Mrs Bullock at Goodman’s Fields on 13 October 1735. Duets were quite rare, although four different couples were billed between 1715-1716 and 1725-1726. After 1735-1736, the dance type disappears from the bills, except for a single performance of ‘A New Dance call’d Le Passecalle de Zaid’ by Anne Auretti at Drury Lane on 26 March 1754 (the occasion was her benefit). The passacaille reappears in the early 1770s for occasional performances until the mid-1780s. For most of the passacailles performed in London, it is all but impossible to know what was danced either in terms of the music or the choreography. There are exceptions. The earliest is Pecour’s version of the passacaille from Lully’s 1686 opera Armide, created as a solo for Mlle Subligny and performed by her ‘en Angleterre’ during the winter of 1701-1702 – the only time she visited London. This demanding solo (a mere 149 bars) was published in notation around 1713. Anthony L’Abbe’s version of the passacaille from Lully’s Armide was created as a female duet, and must have been danced late in the 1705-1706 season in the brief interval between Mrs Santlow’s debut and Mrs Elford’s retirement. In his Preface to The Art of Dancing, the manual of dancing he published in 1735, Kellom Tomlinson referred to ‘Miss Frances, who, on the Theatre Royal in Little Lincoln’s Inn Fields, performed the Passacaille de Scilla, consisting of above a thousand Measures or Steps, without making the least Mistake’. He seems to be referring to the music from Gatti’s Scylla, if not to the choreography created by Pecour for Mlle Subligny (although neither the music nor the notated dance extends to a thousand bars). A Miss Francis did in fact dance a ‘new Passacaille’ at the Lincoln’s Inn Fields Theatre on 19 March and again on 27 April 1719. The other exception is, of course, L’Abbé’s solo for Mrs Santlow referred to above. Although no date or place for a performance of this choreography is known, it is a stunning example of the challenges of such a dance. Was the music for the other passacailles billed in the early 18th century invariably French? There are some beautiful examples of the dance type (usually titled chaconnes but with the features of passacailles) among late 17th-century music by English composers. Some of these were undoubtedly danced in the semi-operas of the period. Did any of the other performers billed in passacailles dance the choreographies that have survived? Mrs Bullock is known to have been a virtuoso dancer. She danced a passacaille with Charles Delagarde at Lincoln’s Inn Fields on 7 May 1716 as well as her later solo, either of which could have drawn on notated dances. Since they were showpieces, it is not surprising that most passacailles were billed for benefit performances, although not always the dancer’s own. It is interesting that not one of the named performers, male or female, of passacailles given in London up to 1735-1736 is French. There are many puzzles about French dancing in London’s theatres in the early 18th century. This entry was posted in Dance Treatises & Notations, Stage Dancing and tagged Anthony L’Abbé, Baroque Dance, Guillaume-Louis Pecour, Hester Santlow, Marie-Thérèse de Subligny, Passacaille on August 23, 2017 by moiragoff. Weaver was drawing attention to the greater power and amplitude in the performance of dancing on stage. His list of ‘some Steps peculiarly adapted to this sort of Dancing’ reveals its innate tendency to virtuosity, for he mentions ‘Capers, and Cross-Capers of all kinds; Pirouttes [i.e. pirouettes], Batteries, and indeed almost all Steps from the Ground’. These are among the more difficult steps recorded in Feuillet’s Choregraphie and Weaver had himself recorded them in notation for his translation of that work. Is he contradicting himself when, in his next paragraph, he declares that serious dancing is ‘the easiest attain’d’ of the genres, even if he adds that ‘a Man must excel in it to be able to please’? Despite his dismissal of serious dancing, at least so far as his ambitions for dance drama are concerned, Weaver provides further insights into its demands. He is, of course, talking about the rigours of classical dancing, the genre that strives for formal technical perfection. Weaver is forced to admit that ‘the French excel in this kind of Dancing’ and he singles out Guillaume-Louis Pecour, ballet master at the Paris Opéra, as an exemplar in the genre. It is interesting that Weaver lauds Pecour for his mastery of ‘the Chacoone, or Passacaille, which is of the grave Movement’. In London, Anthony L’Abbé created two highly virtuosic solos: the ‘Chacone of Amadis’, to music from Lully’s 1684 opera Amadis, for Louis Dupré – Weaver’s Mars; and the ‘Passagalia of Venüs & Adonis’, to music from Desmarets 1697 opera Venüs & Adonis, for Hester Santlow – Weaver’s Venus. Both choreographies post-date Weaver’s Essay and perhaps date to shortly before The Loves of Mars and Venus. They reflect the tradition of French serious dancing to which Weaver’s two principal dancers, and indeed Weaver himself (as a teacher at least), belonged. This entry was posted in Dance Treatises & Notations, Stage Dancing, The Loves of Mars and Venus and tagged Anthony L’Abbé, Baroque Dance, Beauchamp-Feuillet Notation, Guillaume-Louis Pecour, John Weaver, Serious Dancing on May 16, 2017 by moiragoff. My work in baroque dance has always had a strong practical element. I find it easier to understand and write about the dances I have reconstructed. Much of my earlier work was based around dances I actually performed. Performance opportunities are few and far between nowadays, for a variety of reasons, but I try to continue reconstructing notated choreographies as part of my research. I’ve recently been working on a loure, a duet to the air ‘Jouissons les plaisirs’. The music is identified on the notated ‘Entrée pour un homme et une femme Dancée par Mr Balon et Mlle Subligny au Ballet des Fragments de Mr de Lully’ in the Recüeil de dances contenant un tres grand nombres, des meillieures Entrees de Ballet de Mr. Pecour published in Paris in 1704. The work of reconstruction has had its difficulties – I have a recording of the music which is beguiling but otherwise not great and I have nobody to partner me, which all too easily leads to misinterpretation of the notation. Yet, I have found this little dance to be utterly charming. It is so prettily evocative of the early 18th century that it has been a delight to learn. I would love to see it in a good performance. I like to know about the original contexts for the notated dances I reconstruct. In this case the air seems to have been written for the 1670 comédie-ballet Les Amants Magnifiques – the ballet in which Louis XIV apparently did not after all make his final performances as a dancer. The notated choreography, and its music, are instead associated with the Ballet des Fragmens de M. Lully first given at the Paris Opéra in 1702. This ballet brought together pieces of Lully’s music from the ballets de cour and comédies-ballets of the late 17th century into several entrées arranged by Campra. Its popularity was such that it was revived in 1708, 1711, 1717 and 1722. In Les Amants Magnifiques ‘Jouissons les plaisirs’ was a vocal duet by shepherdesses, in the Ballet des Fragmens it was entitled ‘[Air] des Jeux Pithiens’ and formed part of the first entrée, a ‘Fête marine’, as a vocal duet by female sailors accompanied by the dance. I can’t quite relate either the song or the dance to the later context, but I’m probably missing something. I have been looking at ‘Spanish’ loures, but this dance surely falls into the ‘pastoral’ category. It is short, with only 54 bars, and the music is a rondeau (ABACA, A has 9 bars, B has 12 and C has 16 bars). The music has the time signature 3, in common with the famous ballroom duet Aimable vainqueur. It is quite unlike the ‘Spanish’ loures in 6/4. Although it is a stage dance, there are no difficult steps in this little entrée. Many of the pas composées incorporate quarter, half or (occasionally) full turns and nearly half include small jumps, so the sequences are flowing and lively. There are coupés avec ouverture de jambe which provide a pleasing suspension of movement and several other steps with a similar feel of extension. I like to draw on ballet’s ronds de jambes, even demi grand ronds de jambe, to give a greater sense of amplitude. The little jumps woven throughout add energy and make the pas de bourée and other ‘walking’ steps feel light and playful rather than languid. I haven’t yet mastered the musicality of this choreography, but I’m sure that if and when I do it will add to the pleasure of dancing it. Perhaps the most important aspect of the dance is its figures, not so much the movement of the dancers within their stage space as the continually changing spatial relationships between them. They turn towards and then away from each other, face or turn their backs on one another, approach and retreat as they dance. On the page, the floor patterns look completely conventional, even banal, but they are transformed by the way the dancers turn on their own axis and move around each other. Without a partner it is difficult to be sure, but my guess is that the figures are quite tight and the couple stay close to one another much of the time, particularly when they circle and cross. There are many opportunities for interaction, through glances, turns of the head and épaulement as they move through their shared space. Even without a partner, the choreography conjures up the graceful flirtation of a fête galante. It brings to mind the paintings of Watteau, Lancret and Pater. It would be so easy to perform as a tiny drama of pastoral love and pleasure. Lancret’s painting of Mlle Camargo and her partner is some thirty years later than the dance to ‘Jouissons les plaisirs’, but it gives a good idea of the style and affect of such a duet. This entry was posted in Stage Dancing, Steps & Figures and tagged Baroque Dance, Claude Ballon, Guillaume-Louis Pecour, Loure, Marie-Thérèse de Subligny on December 13, 2015 by moiragoff. In an earlier post, I looked at the ‘French’ saraband. I thought I’d turn to the ‘Spanish’ saraband, but I quickly got caught up in a confusing web of ‘Spanish’ dances. There are four notated dances that can be defined as ‘Spanish’ sarabands, because of their music. Two are solos for a man, one by Favier (in an undated manuscript) and the other by Feuillet (in his 1700 Recueil de dances). The other two are solos for a woman, from Feuillet’s 1700 collection and Pecour’s 1704 Recueil de dances. All four choreographies use the ‘Ier Air des Espagnols’ from the Entrée ‘L’Espagne’ in the Ballet des Nations at the end of Le Bourgeois gentilhomme. I’ll come back to these dances later. There are four surviving choreographies to the Folie d’Espagne music. This is, of course, also a saraband. Two of these dances are very closely related: Feuillet’s solo Folie d’Espagne pour femme published in 1700 was lightly adapted to become a duet, recorded in a manuscript collection where it is attributed to Pecour. There is also one solo for a man by Feuillet, surviving only in manuscript, and another by Pecour in his 1704 Recueil de dances. I will return to these four choreographies too. On the London stage, the Folie d’Espagne was advertised under that title only once – at Lincoln’s Inn Fields on 29 May 1718 when it was performed ‘by a Little Girl that never danced on the Stage’. Feuillet’s Sarabande Espagnole, a solo for a man in his 1700 collection, is actually a loure or gigue lente, another dance type that often has ‘Spanish’ connotations. There seem to be both ‘French’ and ‘Spanish’ loures, for some of the choreographies using this dance type have a pastoral or amorous context, at least so far as their music is concerned. The most famous ‘French’ loure is Pecour’s Aimable Vainqueur. Another eight notated dances are designated ‘Spanish’ either in their titles or through their music. Five are loures, three of which are male solos. Two are by Feuillet, an Entreé DEspagnol surviving in manuscript and a Sarabande Espagnole pour homme in his 1700 collection. The third solo is the Spanish Entry in L’Abbé’s A New Collection of Dances dating to the mid-1720s. Pecour has an Entrée Espagnolle pour une femme and an Entrée pour deux hommes in his 1704 Recueil de dances. Both use the same piece of music from the Entrée for Spain in Campra’s L’Europe galante of 1697, as does Feuillet’s Entreé DEspagnol. The other two male solos use another tune from the Entrée L’Espagne in the Ballet des Nations. Spanish dances were quite popular on the London stage. There were male and female solos, as well as duets, trios and a variety of dances for larger groups. It is virtually impossible to know what these choreographies were like, although the links of so many of the dancers to France and their training in ‘French’ dancing suggest that many were sarabands or loures or perhaps the Folie d’Espagne itself. Most of the advertisements for a ‘louvre’ probably refer to Aimable Vainqueur. However, there are a few billings for male and female solos, which may well be ‘Spanish’ loures. Among the last of the dancers to be advertised in a solo ‘louvre’ was La Barberina in the 1740-1741 and 1741-1742 seasons. There is also the question of what made a dance ‘Spanish’ (apart from its music). I’ll come back to this. This entry was posted in Stage Dancing and tagged Anthony L’Abbé, Baroque Dance, Folie d'Espagne, Guillaume-Louis Pecour, Loure, Raoul Auger Feuillet on November 29, 2015 by moiragoff. The most famous ballroom duet of the 18th century was undoubtedly Aimable Vainqueur. Pecour’s choreography was first performed before Louis XIV at Marly early in 1701 and published in notation later that same year. By the time the dance appeared in Magny’s Principes de Choregraphie in 1765 it had been printed at least ten times. It also features in four manuscript collections of choreographies. Did all these copies drive the duet’s popularity, or did they simply reflect it? Pecour took his music from Campra’s opera Hésione, given its premiere at the Paris Opéra in December 1700. Hésione proved popular, enjoying three revivals by 1743. Pecour was obviously quick to capitalise on its success. I will say more about the duet’s original performances in another post. Aimable Vainqueur attracted attention beyond the French court. A new notation by the dancing master Richard Shirley was published in London in 1715. The dance was mentioned by Taubert in his Rechtschaffener Tantzmeister published in Leipzig 1717. John Weaver included it, under the title The Louvre in response to its dance type – a loure, in the second edition of Orchesography (his translation of Feuillet’s treatise Choregraphie) which appeared in the early 1720s. I haven’t pursued the performance history of Aimable vainqueur at the French court and in Paris, but it was first performed on the London stage on 14 May 1726 at the Lincoln’s Inn Fields Theatre by Dupré and Mrs Wall. He was not ‘le grand’ Dupré, as is often claimed, but he was probably French and may have been from the same family. The dance was almost always titled The Louvre in advertisements for its stage performances, perhaps following Weaver. It wasn’t given again until 5 April 1731, when Francis Sallé performed it at Lincoln’s Inn Fields with his sister Marie. Thereafter it quickly became a staple of the benefit performances of London’s leading dancers. The dancer responsible for the popularity of Aimable Vainqueur on the London stage was probably Leach Glover, French-trained and a leading dancer at the Covent Garden Theatre. Glover performed The Louvre at his annual benefit performances from 1731 (when he partnered Marie Sallé) to 1741 (when he danced it with the Italian ballerina Barbara Campanini, known as ‘La Barberina’). Other leading dancers to perform Aimable Vainqueur regularly at benefit performances included Michael Lally, who pursued a very successful career in London’s theatres, and later Augustin Noverre, brother of the famous ballet master Jean-Georges Noverre. The last recorded performance of The Louvre on the London stage was on 23 April 1777 at Drury Lane, when the Miss Stageldoirs danced it with a Minuet and an Allemande. The bills are silent on whether one of the girls danced in ‘boy’s clothes’ although, given their repertoire together, this is quite likely. What choreography did these dancers actually perform? I cannot give a definitive answer, but as well as the dance recorded in notation in 1701 there are some interesting possibilities. I will consider these in a later post. This entry was posted in Ballroom Dancing, Stage Dancing and tagged Augustin Noverre, Baroque Dance, Guillaume-Louis Pecour on October 3, 2015 by moiragoff.